I have had so many people ask me the easiest way to start a blog ever since I became a blogger (7 years ago – ah!). So, it’s about time I sit down and give you a super easy step by step tutorial on how to launch your own blog without hiring anyone! If the thought of starting a blog gets your palms all sweaty because you don’t know a programming language like CSS or HTML, fear not! You do not have to know how to program whatsoever to start a blog! Awesome, right? Like I said, this method I’m describing to you today truly is 100% the easiest way to start a blog, and you can do it all by yourself. For the record, I don’t know how to program at all, and I doubt I’ll ever learn. Even though I’m not a tech wizard, I’ve been able to grow my blog to produce an income of over $100,000 a year! If I can do it, you can do it too. Trust me on this! Essentially, if you can follow directions and click a few buttons, you can totally build a blog all on your own. You won’t even have to hire anyone to help you. Like I said, it’s the easiest way to start a blog that exists. I estimate that the tutorial below should take you about 30 minutes or less before you’re the owner of a bright, shiny new blog that’s all yours! I am able to make six figures a year, something I could never do in my previous profession. I work from home in my yoga pants every single day! I can take a break from work and head downstairs and hug and smooch both my kids whenever I want. I take every single Friday off so I can have 3 day weekend. I’ve made some of the best, most inspiring, most amazing friends of my life in fellow bloggers. If you always feel like you don’t fit in, the most awesome people are right here on the Internet. As you can see there are some MAJOR perks to blogging. It is hands down the most amazing job I could ever dream of, and I had no idea when I started 7 years ago how much it would positively affect my life. I also didn’t know the easiest way to start a blog, and I went about it all the wrong way. That’s why I’m determined to help you get your blog started correctly right from the start. I should mention also that all the perks above didn’t happen instantly. Blogging, like any other job, does take time, persistence, and a concerted effort day after day. The thing is, though, if you never start a blog, you’ll never know of all the amazing opportunities that could come your way! So, stop dilly dallying! Make today the day you do it! And, no excuses since I’m showing you the easiest way to start a blog so you don’t have to worry about overcoming tech issues. Also, many new bloggers worry that no one will care about what they have to say. This isn’t just true! Lots of people also worry that they can’t be successful because there are hundreds of other [food/health/beauty/finance/lifestyle] bloggers out there. This is also not true! Remember, YOU are UNIQUE and your voice deserves to be heard. So, let’s get to it! The time to start your blog is now – today! I recommend opening a new tab and just going back and forth between your new tab and this post so you complete each step one by one. I’ll describe the steps to starting a blog first, and then I’ll elaborate on each one below. Before you do any of the technical steps of starting a blog like buying your hosting account, it’s important to sit down, gather your ideas, and make a plan for your blog. Most people overthink this step way too much. It should actually be easy. There is so much pressure now to create absolutely perfect blogs with perfect designs and publish just the right number of posts, but that fear of perfection will hold you back. I’ve coached many new bloggers, and lots of them admit they spent too much time thinking of the perfect blog name, when they could have used that time writing, meeting other bloggers, or setting up their social media accounts and growing their platforms. The great news is that blog names don’t have to be forever! My blog was called Budget Blonde for five years! I only recently rebranded my entire blog and business to be under my name, Catherine Alford, in 2015. I can tell you that having a blog under your own name is becoming very mainstream among full time bloggers. I can think of several bloggers off the top of my head who switched over highly profitable blogs into blogs under their name. So, if you don’t want to be an anonymous blogger, you might want to consider calling your blog your own name. If you were a travel blogger, your tagline might be something like, “My Adventures & Misadventures Around the World” or if you were a healthy cooking blogger it might be something like “Helping Moms Find The Time to Cook Healthy Food“. In essence, your tag line is like your one sentence bio that tells your readers what to expect when scrolling through your posts. Keep in mind that the domain name (aka the URL) that you want might be taken, so below in Step 2, you might have to try out a few and be flexible to find the one you want. Essentially, as long as you take a few minutes to think about what you want to write about, some possible blog name ideas, and perhaps 5-10 post ideas, you’ll be well on your way to setting up a blog you can be proud of. Remember, don’t overthink the name! Choose one you like, and mold your blog empire around it! You’re awesome, and you can do this! It really is that easy! Okay now let’s get to the nitty gritty. Let’s talk about hosting. First of all, what the heck is hosting? I’m glad you asked. Hosting is like buying real estate on the Internet. You might see a lot of blogs on something called Blogger or Blogspot offering totally free blogs, but the problem with those sites is that you don’t own your own Internet real estate. Like renters, you can’t really paint the walls or make it your own or invite advertisers in. So, if you want your blog to reflect you and you want to be a successful blogger, the best and the easiest way to start a blog that you will own 100% is to buy your own piece of Internet real estate and you do that by purchasing your own hosting. BlueHost is great for someone just starting a blog. They are a big company with a lot of customer service agents ready to help you if you get into trouble. If your blog grows a lot, you might outgrow BlueHost, just like you might outgrow your first house when you start having a lot of kids. This happened to me about 5 years into blogging. My audience grew and my “house” was too small so I had to switch to a different host so my site would load properly. Keep in mind that I was a full time blogger when this happened, so you should not have to change hosts anytime soon. Essentially, I recommend BlueHost because it is by far the most inexpensive hosting company available, but even though it is inexpensive, it still served me well for 5 years until I outgrew it. And, because I am a BlueHost supporter, I can actually offer my readers a big discount on hosting and a FREE URL – woo hoo! Sometimes domain names can be around $15, so this is the perfect way to set up your blog in a very inexpensive way. 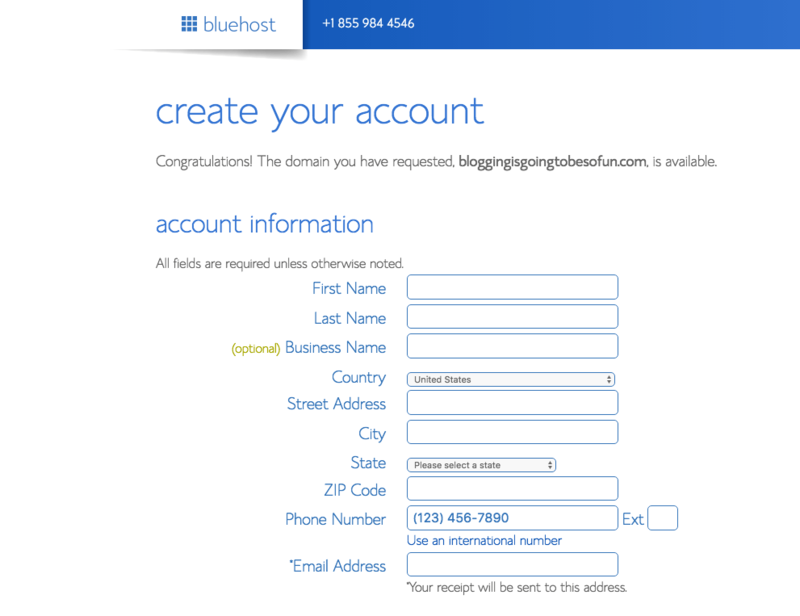 All you need to do to get started is to click this BlueHost link, which will open up the BlueHost tab in a new window. 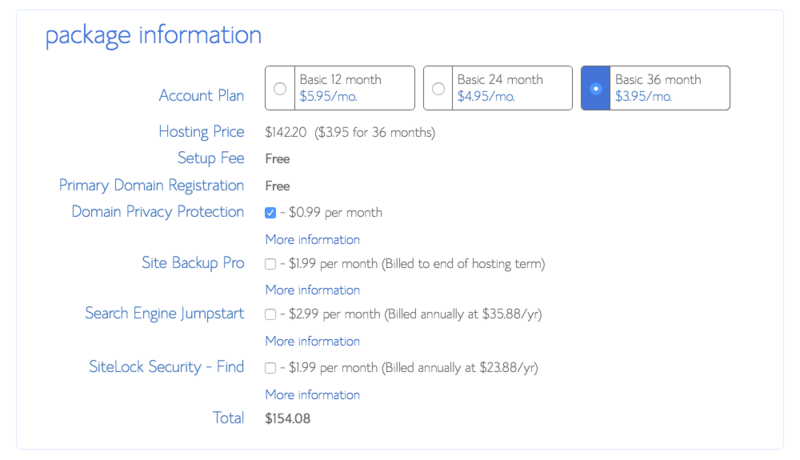 Side story: BlueHost recently charged me $150 for hosting for a website I don’t own anymore. I sold it to someone else, and I forgot to let BlueHost know. So, when it came time for the hosting for that site to be renewed, I got charged. But, as soon as I told them the site wasn’t mine anymore, they refunded me the same day! So, they are really good about things like that. Okay, I’m getting off topic so let’s get back to it. 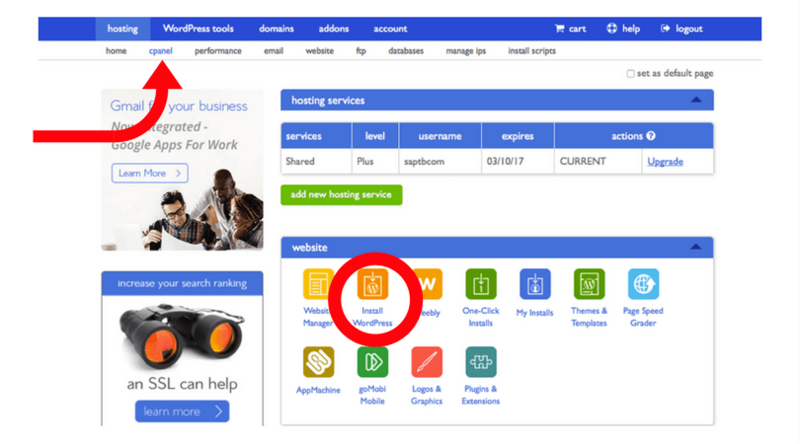 As you can see there are three options for hosting, and even though the middle one is the most popular, I still am going to advise you to pick the basic level of hosting all the way on the left. The reason is again that you are a new blogger, and it’s important to keep expenses low when you’re starting a new biz. The basic hosting is what I started with, and it’s perfect for someone who is new to blogging. Remember, you can always upgrade later. What I’m trying to show you is the easiest way to start a blog without hiring anyone or spending a lot of money. And, as you can see, because you are my awesome reader, you get a free domain name! Woo hoo! So, you’re going to want to go to the box on the left where it says “Help me get my free domain!” and type in the domain name that you want. If the domain name you want is not available, BlueHost will suggest a few that are. Or, you can go back and try a different one until you get one that you like. Keep in mind again that you might have to try a few variations just in case the name you want isn’t available. For example, you might have to put a middle initial in your name if you’re using your name as your blog name or maybe you want to put in a nickname. Either way, I do recommend that you try to get a “.com” name vs. a “.net” or any other ending to your URL – It just comes across as more professional that way! Side note: Be a little patient with the step above. Sometimes if the site is busy, like late at night, this window might take some time to load. 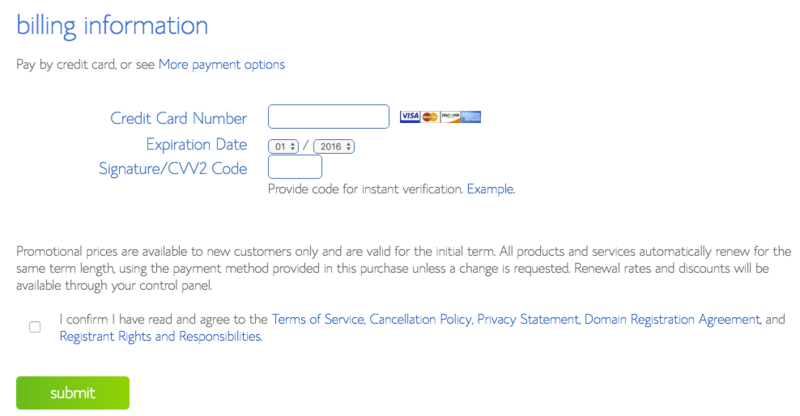 Once your domain name is approved, scroll down on this page and fill out your account information. Be sure to put a legitimate e-mail address that you use often on that bottom line, since BlueHost will be sending you log in information to that address. After you fill that out, scroll down again, and you’ll see the package information page. As previously mentioned, I recommend buying the 36 month package because you get the best monthly price that way. Remember, if you decide to quit blogging or feel like it’s not for you, you can cancel your account and BlueHost will pro-rate it and refund you for the months you don’t use, so there is no risk. 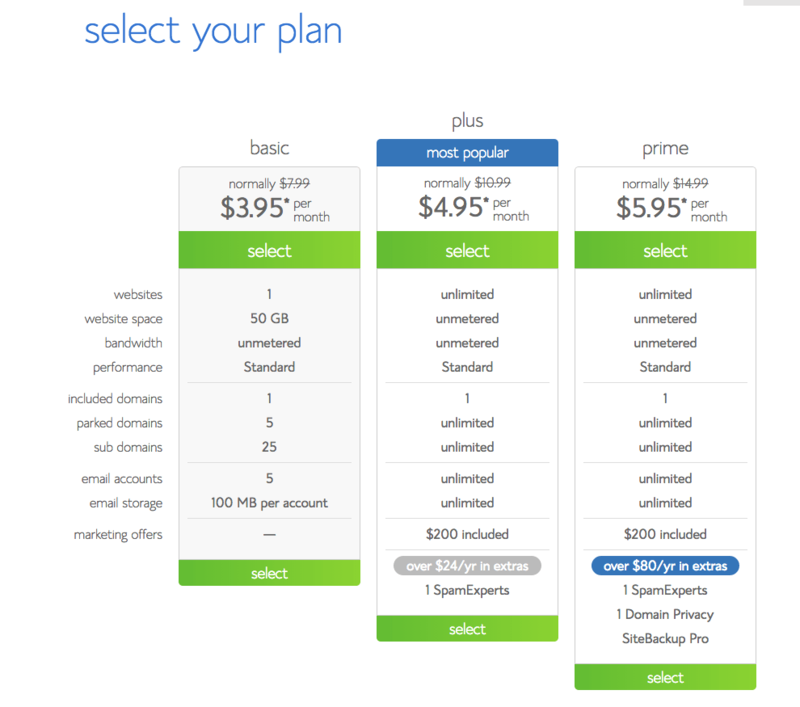 You’re going to also see a ton of options like site backup, search engine jumpstart, domain privacy, etc. You really don’t need any of these extras. 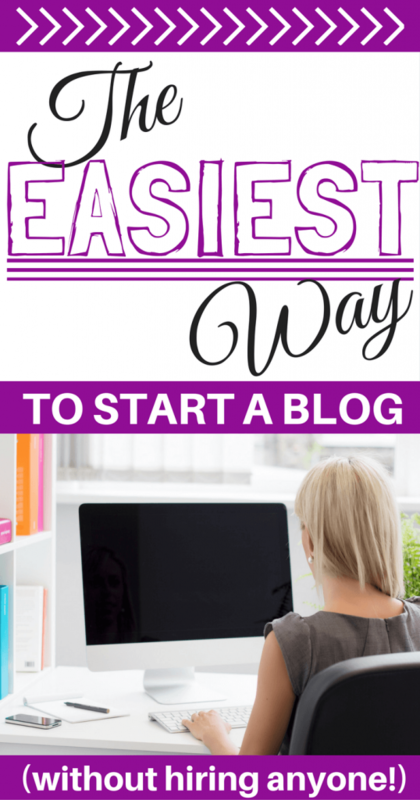 Remember, I’m trying to show you the easiest way to start a blog without a ton or extras or bells and whistles. You can always add them on later as your site grows. The domain privacy protection hides your name from public record online – Anyone can see the person who owns any website via an online search. If you are an anonymous blogger, this is a good option. If you’re not an anonymous blogger, then you won’t need this extra expense. Press submit & viola! – You are now the proud owner of your own slice of the Internet. Go ahead and create your password. I recommend getting a strong password and putting it somewhere you can remember. It’s important to have very strong passwords to your hosting account to keep hackers out. My password is a huge mix of random numbers and letters and because I can’t remember it for the life of me, I keep it in a place where I can always refer to it! Alright, so now that you’ve got your hosting account purchased and you created a password, you can finalllllllly go to step 3! Okay, you are now SUPER DUPER close to getting to write a post on your blog. 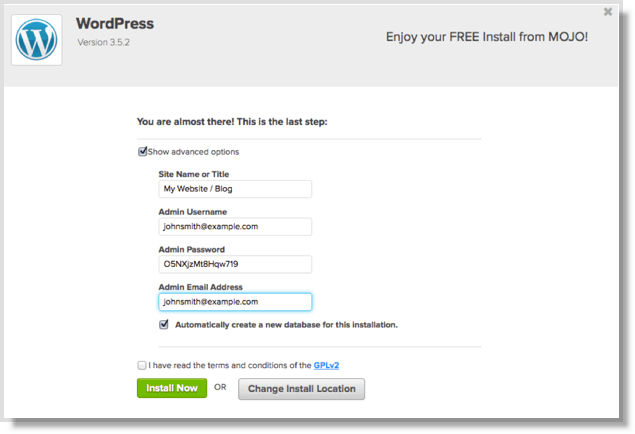 All you need to do now is install wordpress. I’m so glad you asked. 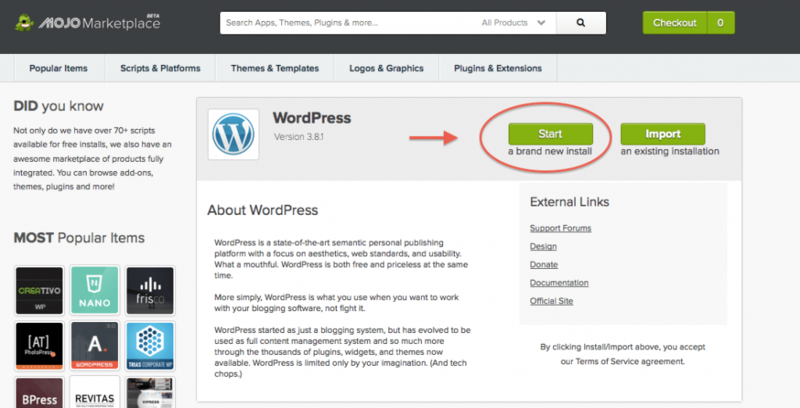 You’ve probably heard of wordpress before because many, many people have wordpress blogs. To keep using the house analogy, think of wordpress like your house blueprint. You need it to actually build your blog. You have a hosting account now. But, your website is still blank. There is nothing there. And, because I promised you this process would be the easiest way to start a blog, I don’t want you to have to code or program anything. And, with wordpress, you don’t have to. That’s why it’s the bee’s knees. BlueHost is your plot of land. Wordpress is the blueprint you need to build some foundation. You install WordPress, i.e. “your foundation” onto your hosting account which will turn it into a blog. Once you have the blog, you can then design and “paint” your blog any color you want with any design you want, but you first need this foundation. 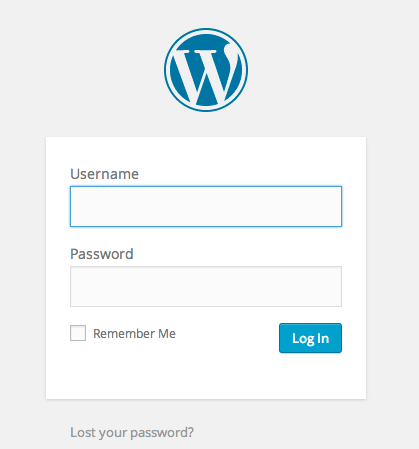 It’s time to actually log into your own BlueHost account so you can install wordpress. 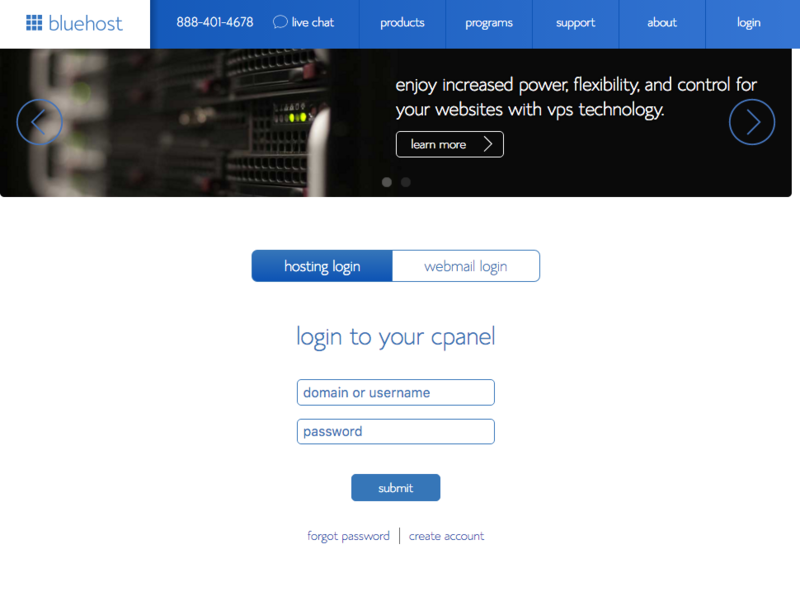 You should get an e-mail from BlueHost with a link to this page but you can also access the BlueHost cpanel (kind of like the brain of your blog) by accessing this link and putting in your domain name and the password you selected in the previous step. Press start. Then, select the domain that you just picked out. Now, you have one step left! Click “check domain” which might take a minute or two. Then, make sure you click “show advanced options” when you see the screen below. This is where you’re going to put in your wordpress username and password. You can also put your blog name in there, which you can always change later. Your blog name doesn’t always have to match your URL. These are just the words that will show up at the top of your blog. Super duper important: Your admin username should not be “admin” or something easy to remember. Just like your password, it should be something complicated. Trust me, you do not want your blog hacked. It’s a pain to get fixed so this is probably the most important step right now: picking a user name that is complex. No hackers allowed!! Click on “View Credentials” on the right hand side and you’re going to see all the log in information you need to log into your wordpress site. So, now you have the URL that you’re always going to go to every time you want to log into your blog. You won’t usually have to log onto BlueHost or the cpanel unless you want to renew your hosting, get a question answered, or tweak something on the inside of your blog. Now we are finally getting to the fun part! If you’ve made it this far, I’m proud of you. You literally did this by yourself and even though it’s the easiest way to start a blog, the fact that you can do it without programming experience and without hiring anyone is truly awesome in my humble opinion – so kudos to you! So, this area is called the “wordpress dashboard” – You can see the word “Dashboard” highlighted in blue on the top left. I put two giant purple arrows within the dashboard to show you the two most important things you need to know about. The first purple arrow is pointing to “Posts” – This is where you can write your first post! Click “posts” then you’ll see a drop down menu where you can click new post. This will bring you to where you can write your new post and press publish. It’s as easy as that! The second arrow is pointing to “Appearance.” This is where you’re going to go if you want to change the look of your blog. 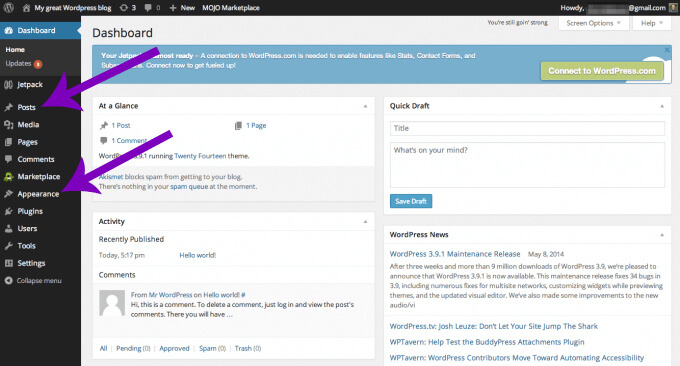 Your blog comes ready to go with what’s called a “Theme” already installed. To keep with our house analogy, your hosting account is the land, WordPress is the blueprint you need to build your foundation, and your “Theme” includes all the decorations, paint colors, and general prettiness of your house. Right now, if you’ve created a new wordpress blog from reading this tutorial, your wordpress blog is akin to builder grade materials in your house. So, it’s perfect for a first home or newlyweds who can’t update things just yet. However, if your like decorating or updating your blog, you can click on Appearance, select theme, and change the look of your blog by picking a new theme. You have a handful of themes that come free with WordPress, but you’ll also see some options to buy a theme. I have a custom theme for my blog, which means I paid a designer to create a blog template that is 100% unique to me. This was expensive, and it was years before I was able to afford it. There are many themes that cost around $30 or $50 though. You can buy them online and there are even some people on Etsy or other independent designers who design their own themes. Do a little research to find one that you love, and when it comes time and you want to update the look of your blog, go back to this Appearances -> Theme section and you should see at the top a place to install a theme that you purchased. To me, though, I’d rather you focus on creating great content. The look of your blog is super important, don’t get me wrong, and you should be as professional as you can in its appearance. However, spending hundreds of dollars on hosting or hundreds of dollars on a custom theme is for later on in your blog career. 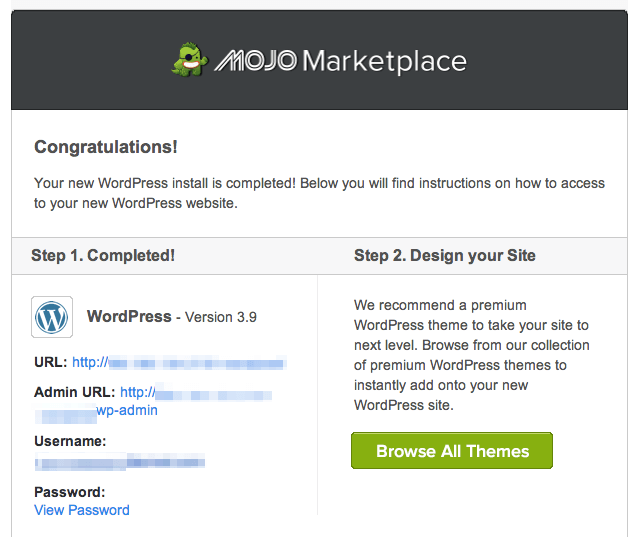 You know how to log onto your wordpress dashboard. You know how to create a post. Now…how do you make people read this thing? How do you experience big success and rake in the big bucks? A lot of people get to this stage, and they are paralyzed. They had this great URL they were so excited to buy. They had a lot of ideas for blog posts, but now that it’s time to put it out to the world, they’re nervous. However, now is the time to put on your confidence pants! Put yourself out there anyway. You are a unique person with a unique story, and if you put your heart and soul into it with the goal of helping people, you will be successful. It’s natural to compare yourself to other blogger or want more pageviews or more social media followers, but I promise all that will come with time. Go ahead and create social media handles for your blog and actively participate on them. I like Twitter and Instagram because those platforms make it easy to meet people and make interacting online enjoyable. Pinterest, though, is a super powerful platform, and I get a ton of traffic from there. Just make sure each time you create a post, you also create an image that in Pinterest friendly, like the one I created for this post below. I create my images using a website called Canva, where you can pre-select the “Pinterest size” when creating a new image. This makes sure your image is the best size for a Pinterest audience. All images are $1 on Canva, which is great because you never have to worry about illegally using someone else’s image. You buy it yourself, so you have permission to use it in your post! I know this is a lot of information. Heck, at 4,000+ words, I think it’s the longest post I’ve ever written in my whole blogging career! But, if I left something out or if you have other questions about social media, the easiest way to start a blog, or the fastest way to grow a blog, please e-mail me at [email protected] I am always here to help, and I love hearing from new bloggers. If you get stuck with wordpress, a great tip is to utilize YouTube videos to find answers to your questions. I can’t tell you how many times I’ve learned how to fix something on my blog from YouTube videos! Most of all, I just really want to end this post by encouraging you to be patient with yourself. Success doesn’t happen overnight, but if you love your blog and you work hard on it, it will happen over time. Remember to write 20% of the time and promote on social media 80% of the time. Also be kind and generous with other bloggers and promote their work too. The more you give the more you get. I live by this philosophy both in my life and when it comes to my business, and I truly credit that with my ability to make such a great income as a blogger. Good luck, and if you want to learn more about my journey of how I grew my blog from super tiny to generating thousands of dollars a month, please read this post. Now, I want to hear from you: Are you going to start a blog? Or, have you recently started a blog? What made you finally start one? What is the best way that you’ve found to grow your blog? Please share in the comments below. That is awesome!! Definitely switch to self hosted and I wish you the best of luck with it!! Great explanation how to start a blog for step by step. Indeed if people don”t know anything but reading above information they can start blogging. Fantastic detail information you shared here. Thank you for valuable information. Hope you updates more information. Hi Cath, I enjoy reading your simple, easy-to-follow tutorial. I am gonna put up a blog and will these tips you gave. I find it really helpful. Thanks! Really? You got so many traffic from Pinterest. I’ll try to look into how Pinterest can benefit my blog. Thanks for this wonderful post, Catherine. Followed all your steps, but can I start them using google blogspot, blogger or wordpress blogs instead of buying a url or host space…? I wouldn’t — part of the steps are using a self hosted blog. I think I explained it a little in the post when I used the analogy of renting vs. buying. When you use something like blogspot you don’t OWN the space and in order to attract advertisers etc you have to own it, thus you’ll need your own hosting. It’s better in the long run. Countless bloggers have had to switch to self hosted over time and trust me it is a pain! That’s a very helpful post, Catherine. I wish I knew this years ago when I started m own blog. Yes, starting out was difficult and it needed determination and persistence. I just learned that being consistent with blogging really helps create traffic and being active in social media. Hi Al! I will e-mail you! He’ll Catherine, All the way from South Africa! But, I am going to get it ready soon! Hi Nidia! That sounds awesome! I say go for it! Here I go!!! Fingers shakin’, butterflies flappin’! 🙂 I’ve search on “how to” pages and this one/yours, gave me the easiest instructions by far. You speak my language & I’m all set up. All I have to do now is write my first blog & pick a theme…which may take me a minute…aka a few days. Aw yay! I’m so excited for you!!! I’m in London UK, just wondering if this is applicable to me or do I need to know about other sites more specific to me based on location? I’ve been interested in starting my blog but haven’t got a clue. You know you are awesome, generous and amazing. I wish only to say – thank you. I’ve definitely considered starting a blog because I feel I have some good topics to write about, but not sure I could be focused enough on one topic to make it worth it. How do you go about making unique content that isn’t just a re-hash of countless articles already out there? For advertising, do you actively pursue advertisers or do they come to you? A “part two” article about monetizing a blog would also be very helpful – adwords, affiliate marketing, etc. Any insights there? Thanks for the suggestion, Nick! I can consider writing a second article but I’d actually recommend you look into blogging courses because the answers to the questions you asked are actually quite detailed. It’s hard to condense 8 years of what I’ve learned in blogging in a single post, but there are many courses that offer this information! Catherine, thank you so much for your detailed explanation. MY PROBLEM IS LOL. I have an existing website that’s connected to the company I sell for so customers can shop at their leisure and put in their payment info. They want me to “point” my domain to Spotlight so WordPress isn’t working. Help!!!! You might want to contact Grayson Bell at iMark Interactive for WordPress tech help! He is awesome! Many years thanks for posting this information. I found you when your we’re Budget Blonde and I was very interested in getting my finances in order. I just read your post about your family trip to Iceland. Wishing you and your family, blessings of happiness, good health and prosperity. Opps, please fix my errors!